Tae Kwon Do is a Korean Art which translates as "the way of the fist and foot". TKD is a great sport for children and adults. Students can benefit from the workout, discipline, and self-defense. Kid Tigers is a class for children age 4 and 5 years old. 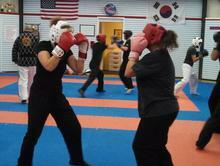 This class teaches the basics of TKD training and Life Skills. Students will learn balance, coordination, and discipline. self-defense. Students will learn realistic and versatile techniques that include striking, joint locking, pressure points, ground survival and weapon disarming. Students ages 8 and up will learn how to use the Bo, Nun-chucks, Tonfa, Sai, Sword, Stick, and Knife techniques. 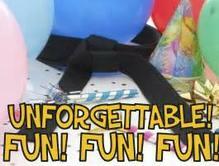 The kids will get a kick out of this birthday party.​ Have a Birthday Party they won't forget! Contact us for pricing and scheduling. Students will learn the basic fundementals of boxing. They will recieve a intense work out and proffessional instruction. Our BELTS aren't ISSUED they are EARNED!